Columbus Blue Jackets' Nathan Horton celebrates his goal against the Phoenix Coyotes with teammate Artem Anisimov. The only thing that wasn’t over the top about Nathan Horton’s debut with the Columbus Blue Jackets Thursday night in the Arizona desert was his TOI. Wisely, Columbus head coach Todd Richards kept his star winger’s minutes just under 15, in a crucial road win over the Phoenix Coyotes. It was Horton’s first NHL game since the Stanley Cup playoffs last season and followed months of arduous rehab from off-season shoulder surgery. What a debut. 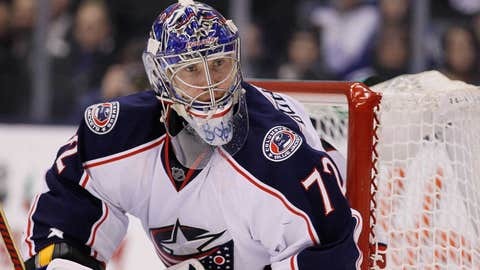 Planting his big body down low during a Blue Jackets power play, Horton collected the rebound of a James Wisniewski shot and slid it into the Phoenix net for his first-ever goal in a Columbus uniform and the 199th of his career. As if scripted, the goal turned out to be the game-winner in the 2-0 win over the Coyotes. Keep in mind that coming into the game in Phoenix, the Blue Jackets power play was three for December. It was one of the primary reasons the team hadn’t been able to forge even a stronger record than its solid 7-5-1 mark for the month. The power play had run out of power; it had no energy. It needed a boost. If there’s one thing Nathan Horton brings to a team — besides his superb power-forward skills and propensity for scoring big goals — it’s energy. The guy’s smile could be a backup generator for at least a medium-sized city. He literally lights up a room when he enters it, and the combination of that smile and happy demeanor are absolutely infectious. And so, there was R.J. Umberger talking to the press after the win over Phoenix and responding to a question about what Horton’s return from injury meant to the Blue Jackets. Umberger, who scored the insurance goal against the Coyotes — also on the power play — talked about the joy Horton has for the game and what an impact it has inside the Columbus locker room. When it comes to putting together a winning hockey team, the more guys you have exuding energy, a positive attitude, and joy for the game the better. Yes, skill trumps all, but the collective persona of a hockey team matters. And Nathan Horton certainly gives the Blue Jackets a significantly upgraded look on the ice with his game-breaking abilities. But don’t underestimate what the Blue Jackets right winger brings off the ice. As much as Horton adds to the overall depth and quality of the Blue Jackets on-ice product, he brings a spirit and demeanor to the locker room that’s hard to quantify but impossible to ignore. He’s an energy booster, and that’s a big deal for any hockey team, especially in the middle of an 82-game grind already condensed in an Olympic year. You can argue whether the idea was a good one. But USA Hockey’s decision to allow reporters into all of the meetings that ultimately led to the roster selection for the U.S. men’s Olympic hockey team was at the very least laudable. It was designed, in part, to give an inside look into the depth of talent among U.S.-born players and the difficulty in paring that talented list down to a roster that would represent the country in Russia. But because of an apparent misunderstanding about whether there would be editorial control over the details of the selection committee’s meetings, the story has become more about Brian Burke’s published criticism of Ottawa winger Bobby Ryan than the actual Olympic roster. That’s unfortunate. While we can all critique the final roster selection and opine about the apparent glaring omissions (like Ryan, Jack Johnson, etc. ), we should also be celebrating the growth in the world-class talent USA Hockey is producing. And we should also be giving credit to those who were actually selected. Time will tell if that group gives the U.S. the best chance at a gold medal, but for the time being, the focus should be on what they’ve accomplished by being named to the team. Instead, we’re talking about Bobby Ryan’s intensity and whether or not he’ll ever return Brian Burke’s calls. Pity.